When two elephants fight, grass gets trampled. No kidding. Though this widely-used African proverb alludes to the extensive damage caused when two great mammals clash, what it’s really communicating is that these great animals need space. However, this proverb is becoming increasingly relevant to cities in Southern Africa as they expand onto the paths of ancient elephant migratory routes. Given the current trend of rapid urbanization across the African continent, more than grass is at risk—elephants are losing their habitats. Despite this pressing danger, policy makers have been slow to address the problem, as previous rhetoric in the region has treated cities and urbanization as issues divorced from the natural environment. Particularly in the southern region Africa, however, failing to acknowledge the migratory patterns of elephant herds results in dire consequences for both residents and wildlife. To achieve sustainability and preserve ecosystems in southern Africa, some groups have been successfully coordinating urban development with elephant migration patterns. Despite the few migratory routes still in existence, ancient elephant routes in southern Africa once spanned South Africa, Mozambique, Zambia, Angola, Botswana and beyond. However, through colonization, civil wars, and—most recently—urbanization, elephants have lost access to a substantial amount of their trails. Now, national parks and game reserves located within southern Africa protect the majority of remaining elephants, but they restrict herd movement and put pressure on local land resources. In response to these strains, the NGO Elephants without Borders reported that some experts are calling for action to control conflicts between people and elephants and to protect ecosystems: cull up to 60,000 elephants in Botswana. Botswana, however, has other ideas for its elephants. Kasane, a town on the northern border of Botswana, is quickly becoming the capital of a mega-wildlife zone, and as a result, has become a destination for tourists and free-roaming animals alike. Furthermore, elephants have been critical to Kasane’s economy. Elephants are essential to the survival of the fauna and flora around them; they prune plants, create firebreaks, expose hidden sub-surfaces for waterholes, and promote ecotourism. Kasane’s experience demonstrates that long-term strategies for managing conflicts between people and elephants are not only a realistic alternative to culling, but also provide benefits to cities and the environment as well. Looking to balance the needs of elephants and the reality of development in southern Africa through ‘urban wildlife corridors’, the Kavango Zambezi Transfrontier Conservation Area (KAZA TFCA) has launched an exciting project with the goal of linking five southern African countries—Angola, Botswana, Namibia, Zambia and Zimbabwe—into one massive space. The open area of 287,132 square kilometers can ensure the safe movement of millions of animals and consolidate the land resources that they need. Elephants Without Borders is currently using Kasane as a case study to evaluate how urban corridors for animal movement might work for other African towns and farms. The hope is that Kasane will convince policy makers to direct development away from wildlife corridors and draft appropriate legislative for designating land. Cities—often built in areas of high biodiversity and natural abundance, with vulnerable coasts, river valleys and habitat edges—are intricately linked to local ecosystems. 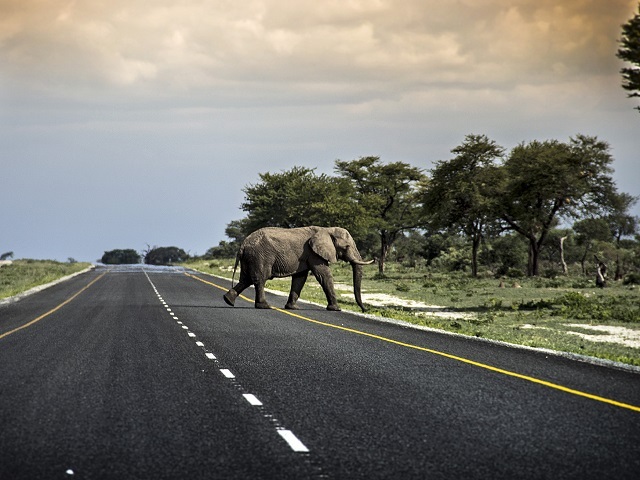 Elephant migration in southern Africa is pushing city leaders to change the way they think of cities, exciting the prospect for smarter design that can address the needs of both the built and natural environments. As Africa becomes increasingly urban, it must learn from these projects and experiences and design cities with the continent’s wondrous wildlife in mind. Just two days ago, the globe rallied behind elephant conservation on World Elephant Day. Leave your thoughts on how African cities and elephants can peacefully coexist in the comments below!